John Barnes hopes Liverpool fans will not put pressure on teenager Raheem Sterling to improve their fortunes after a poor start to the season. The Reds are third from bottom in the Premier League, having failed to win any of their first three league matches under new boss Brendan Rodgers. "To put all the expectations on a young boy's shoulders is unrealistic," Barnes told BBC Radio Merseyside. 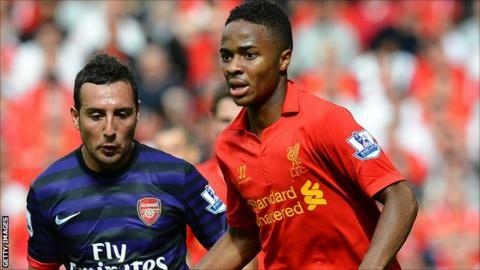 Sterling, 17, was called into Roy Hodgson's England squad on Monday. Hodgson defended the selection, despite the winger having only started three senior games. "He mustn't think he's become part of the set-up and has made it," said the England manager, ahead of Tuesday's World Cup qualifier against Ukraine at Wembley. "When you bring someone in who has only burst on the scene in the last couple of games, I'm causing headlines to be written. "I've explained the thinking behind him coming in and I'll make it clear to Raheem. He'll be pretty lucky to get close to the pitch because there were plenty of players who were chosen in front of him." Barnes, who played more than 400 times for Liverpool during a decade at Anfield, added: "From Raheem's point of view, I'm sure he'll be happy to be involved in the full squad. "I'm hoping for it not to be a Theo Walcott situation, where he was taken to the World Cup as a young player and, because of the expectancy on him, his international career faltered for a while. "I don't want to put any pressure on him at all because he's playing in a team that's not playing particularly well at the moment. "Will there be added pressure on him, because he's in the England squad, to revitalise Liverpool's season? You don't want the pressure to be on a young boy or to rest your hopes on him if your team's not playing well. "It would have been wonderful if he had been coming into a team that was full of confidence and winning matches. He will have had no pressure to perform. "I don't know how he'll cope with it and it's not so much about how he'll cope with it. I'm urging other people not to expect too much and not to put him under pressure."